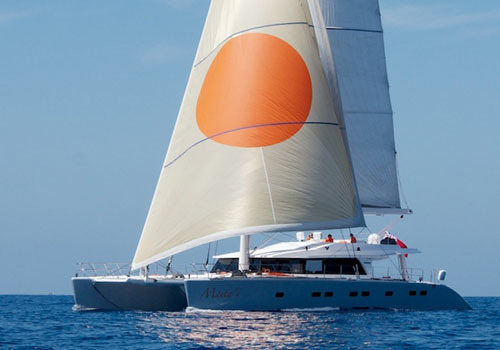 Luxury sailing catamaran MAITA'I (ex CHE) Sunreef 74 is a fantastic Mediterranean and Caribbean charter yacht and one of the most beautiful catamarans around for charter. 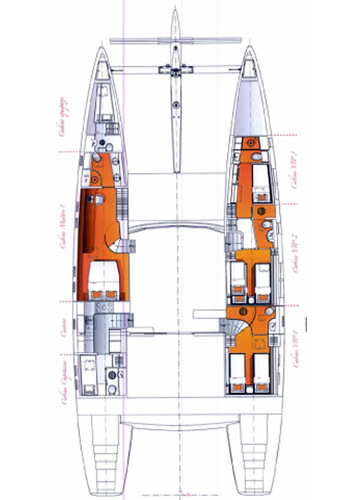 Sunreef yacht MAITA'I was built by Sunreef Yachts in 2003 and designed by Van Peteghem & Prevost for size, sailing comfort, stability and grace. 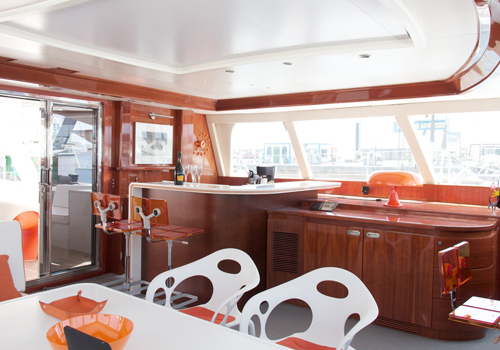 The Sunreef 74 MAITA'I is well designed and unique as well as spacious and luxurious. 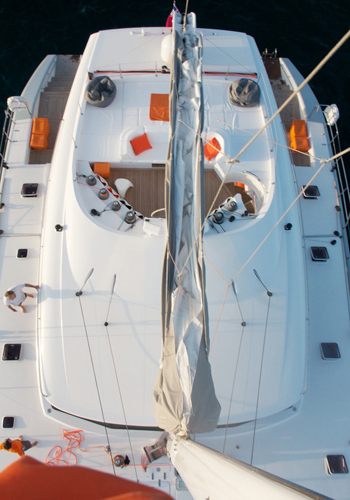 Indeed, the yacht seems to attract many coveted looks wherever she sails past. While you can go on an experience of discovery in the most beautiful places on earth you can also be enjoying all the delights of exceptional comfort and service at the same time. 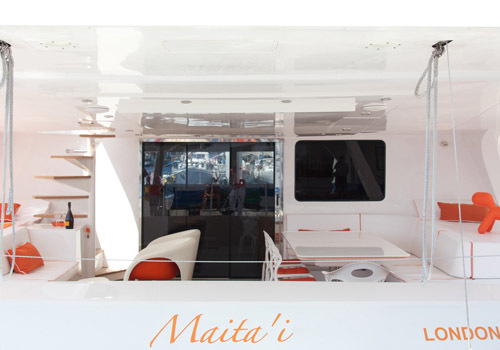 Modern and comfortable, this large catamaran MAITA'I, with a huge 130 m² of stylish and sophisticated, air-conditioned, interior is packed with a generous collection of top-of-the-range technical and electronic entertainment equipment, all of which is touch screen controlled. 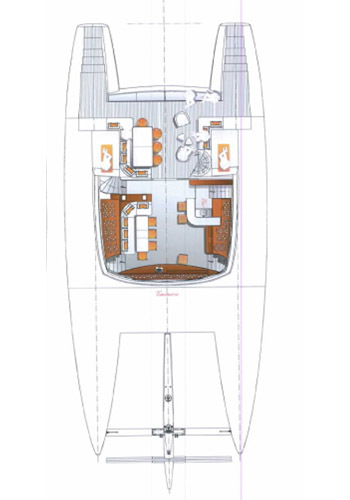 Designed by renowned architecture firm VPLP (winner in 2010 of the prestigious Manley-Bendall Prize by the French Naval Academy and winner of the "1999 Most Innovative Superyacht" and designer of the best racing yachts in the world) MAITA'I (ex CHE) was given a full technical and design refit by its new owner in 2011. Maita’i has unique style, which is modern and very chic! 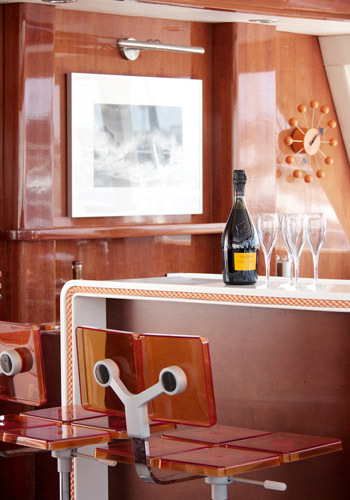 On board, the collection of original works of art sets the tone. 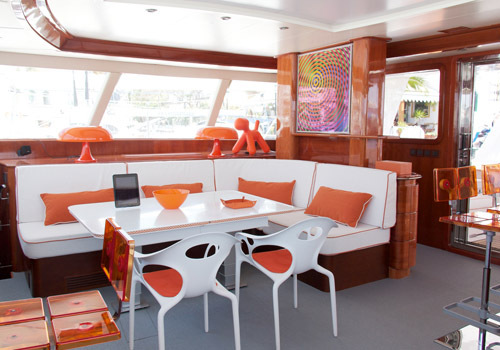 Paintings, sculptures and furniture designs of Alexander Calder, Auguste Herbin, Martha Botto, Philippe Stark and Ross Lovegrove are together with modern conveniences such as iPads & iPods in the cabins and the salon, a Wii games console, large screen television and DVD player with 300 movies available in each cabin. 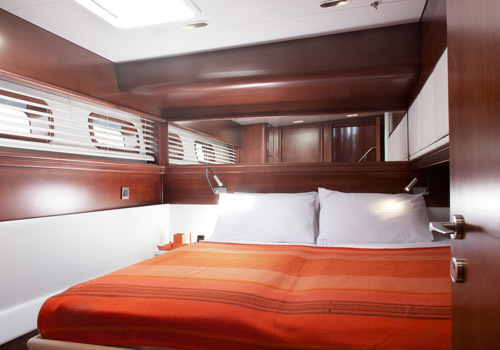 In addition to her style S/Y Maita’i is an amazingly adaptable boat: the double beds convert into single beds, one double cabin becomes a cabin for three teenagers, the tables can be made larger or smaller depending on the guests’ needs, and the dining room can be inside or outside on the fly bridge for a 360 ° view. 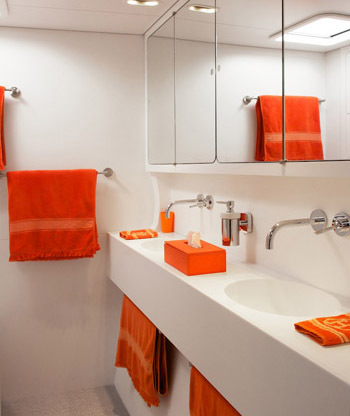 The master suite offers a large dressing room, bureau and bathroom with a Hansgrohe rainShower and white Corian washbasins. 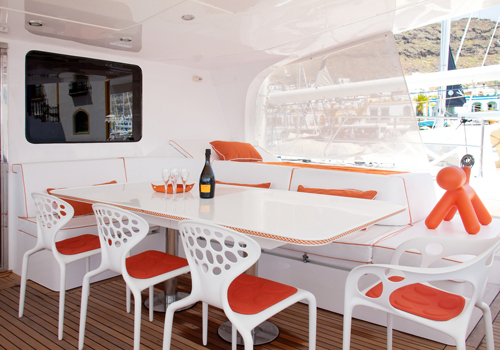 Guests will find it impossible to be bored with the numerous water toys on board, which include: an inflatable 10’ sailing cat, wakeboard, water skis, diving equipment, kneeboard, floats. 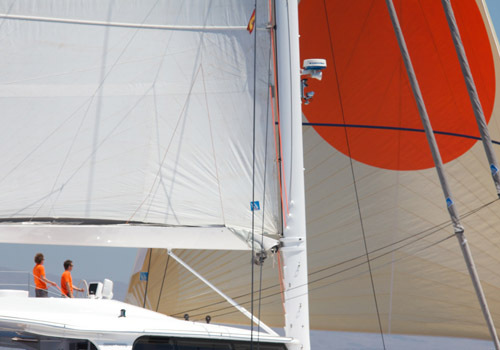 Navigation is not forgotten, and the Maita’i yacht has new Hydranet sails and spectra lines. All of the equipment is on the forefront of the latest technology. 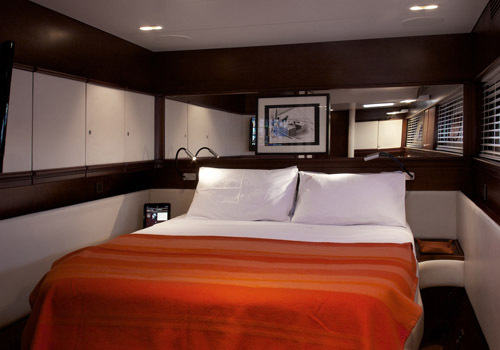 Luxury sailing catamaran MAITA'I, is a Sunreef 74'and provides sumptuous, roomy and very comfortable accommodation for up to 9 passengers in 4 cabins with ensuite showers & heads – including an outstanding master cabin located in the portside hull. The starboard hull is offering a multiple combination of solutions; 2 double cabins easily split into 4 twins if needed for teenagers or singles, one is even offering a triple accommodation with an additional pullman and a further cabin which has an upper & lower berths. 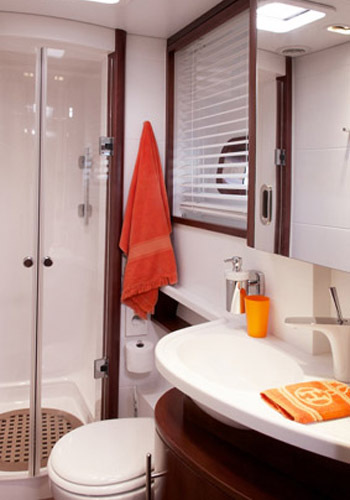 To insure total privacy during a charter, the crew has a separate companionway, as well as theirs own bathrooms & shower. 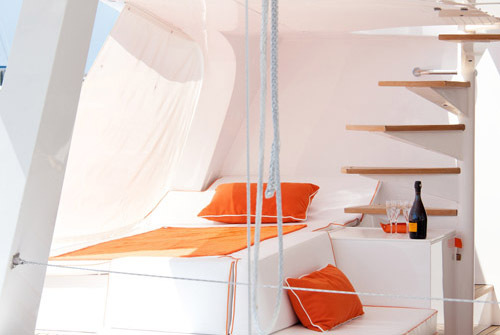 Luxury sailing catamaran MAITA'I Sunreef 74 offers charterers the following extras and amenities: a CD library and CD player, a DVD library and DVD player, music stereo system, local TV, fishing tackle, a wakeboard, water-skis, the yacht's tender is a hard bottomed 16 foot / 4m dingy (with a 50 HP outboard engine). Sunreef 1 is also insured for diving, and there is a crew member who is a diving instructor or a is a certified diver (please confirm), diving is by rendezvous, diving can be done from from the yacht’s stern for certified charter guests, diving and instruction available for non certified charter guest, ther e are four scuba tanks aboard and 5 BCs, 5 regulators, snorkeling gear also available on the yacht.